‘Tis the season for stone fruits! 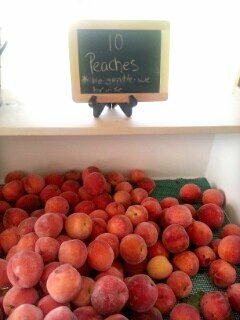 We’ve had plums, peaches, and nectarines crowding the fridge for the past two weeks. 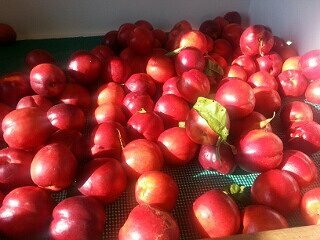 We’ve mostly been eating them just as they come, although I’m finding that it’s a little hard to cut segments from stone fruits that don’t like separating from the pits. This was never a problem until I had a small child who needed his fruit cut into segments. And of course all that lovely sticky fruit juice squishes out between his fingers and gets all over everything. Parenting is a messy business. 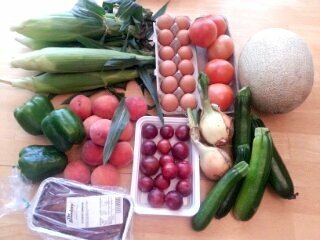 Week 7 of the CSA: 6 ears of corn, green peppers, peaches, Methley plums, onions, zucchini, tomatoes, cantaloupe, eggs, and bread (Breadery blueberry cornbread). 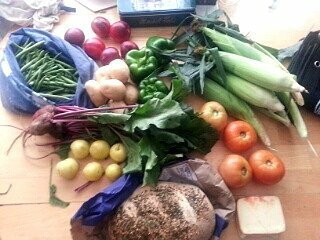 Week 8: green beans, nectarines, green peppers, potatoes, beets with beautiful greens, Shiro plums, tomatoes, 6 ears of corn, and Great Harvest “everything” sourdough. It was a value-added week so I picked up a block of Muenster cheese in place of eggs. I love picking up veggies in Breezy Willow’s new addition, because the breeze moves through the screens and sunlight comes through to dapple the fruits and vegetables. I’ve been lazy these past few weeks, but the CSA most certainly has not; the vegetables have been rolling in at a very good pace. Three weeks ago, it was salad greens and blueberries all the time; now, corn season is picking up in earnest and we’re finally getting tomatoes. Bruschetta, here we come. I used to resent summer, but now I love it for all the wonderful food it brings. 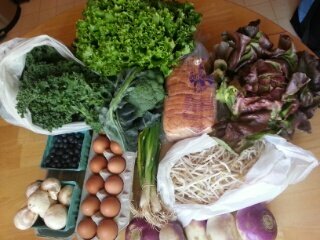 CSA week 3: kale, green and red leaf lettuce, broccoli, spring onions, bean sprouts, turnips, mushrooms, blueberries, eggs, and bread (Wheat? I don’t remember). We managed to eat all of these except the bean sprouts, which got buried up in the fridge drawer and had turned into a brown sludge by the time I unearthed the bag. Poor bean sprouts. Oh, and we haven’t eaten the turnips yet, but I checked on them yesterday and they’re still good. Root vegetables are wonderfully sturdy. 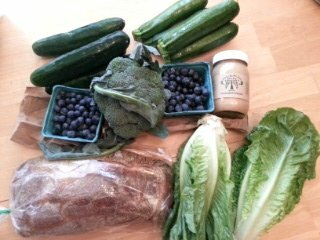 CSA week 4: double blueberry week! Also romaine lettuce, zucchini, broccoli, cucumber, and a mysterious unlabeled loaf of something very ciabatta-like. It was also a “value added” week so we got our choice of sauces instead of eggs. I picked the horseradish mustard (the other choice was BBQ). It seems like slim pickings; I get the feeling I might have missed something at pickup but oh well. 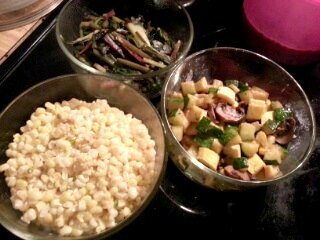 CSA week 5: the season’s first corn! 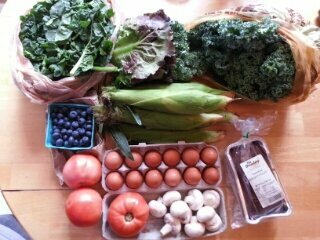 Also, spinach, kale, red leaf lettuce, blueberries, tomatoes, mushrooms, eggs, and bread (pumpkin bread, actually). 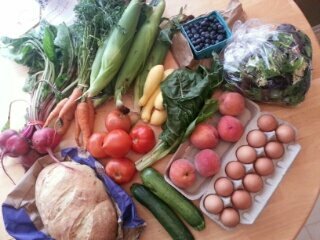 CSA week 6: More corn, beets and carrots with their greens, green and yellow squash, tomatoes, chard, mixed greens, peaches!, blueberries, eggs, and bread (Great Harvest sourdough). I plan to make pesto with the carrot greens, which worked out well last time I tried it. I’m looking forward to trying it on my standby focaccia recipe. Maybe I’ll stick some root vegetables into the oven to roast while I’m doing that. No use wasting oven heat. I sauteed up the beet greens with the chard, and did the same with the squash and last week’s mushrooms. Also the corn. It’s my standard process, and the result packages well for weekday lunches (and reheats well for weeknight dinners). Can I cut it up and saute it in butter and olive oil, with a bit of garlic? If not, then can I eat it raw, with a little grated cheese or a fried egg? If not, then can I cut it into chunks and roast it, tossed with olive oil and a bit of garlic? This takes care of most things. It’s when something doesn’t fall into those three categories that I start looking around for ideas.